McQ Alexander McQueen ponte top. For in-store inquiries, use sku #1966391. Alice + Olivia floral jacquard top. Jewel neckline; modified racerback. Sleeveless. Fitted. Cropped at waist. Polyester/nylon. Combo, polyester/spandex. Lining, nylon/polyester. Imported. Model's measurements: Height 5'10"/177cm, bust 33"/84cm, waist 25.6"/65.2cm, hips 35.8"/91cm, dress size US 2-4/FR 34-36. 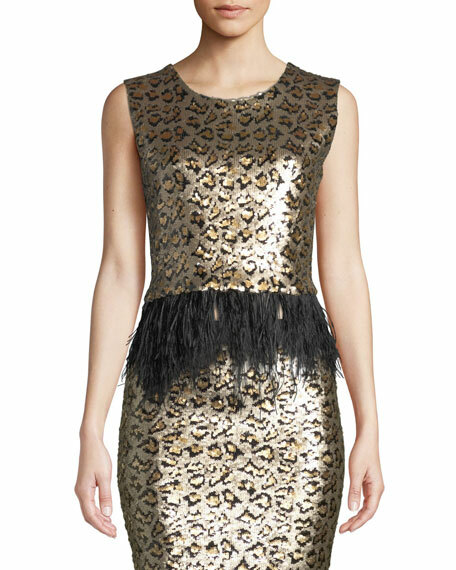 Le Superbe "Liza" top in sequin animal-print motif with ostrich feather fringe. Scoop neckline. Sleeveless. Fitted silhouette. Cropped hem. Side zip closure. Polyester. Polyester/spandex lining. Dry clean. Imported.